Kim Kardashian West and her husband Kanye celebrated their daughter Chicago’s first birthday with an Alice in Wonderland whimsical theme that was fit for their little queen, PEOPLE reports. The birthday bash was set at their Hidden Hills California home for Chicago who turned one year old on Tuesday. 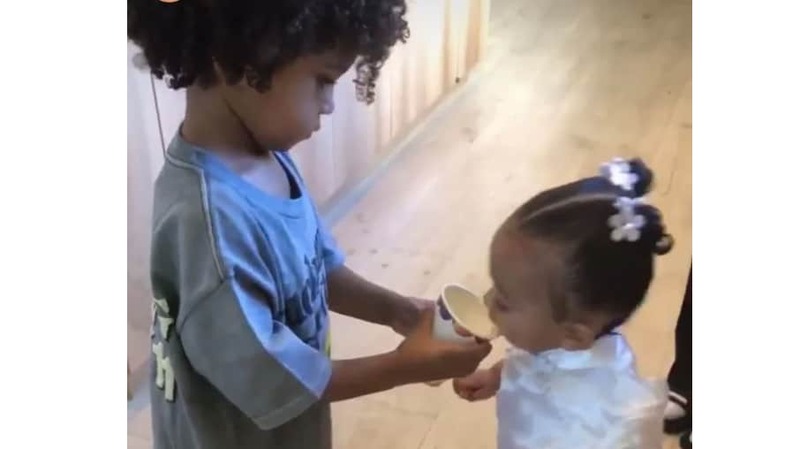 Kardashian posted a video of little Chicago and her brother Saint sharing a special moment as he helped his little sis sip a drink. “You are so nice sharing with your sister,” Kardashian West says on the video as Saint, 3, holds cup steady for Chicago. Kardashian West also shared pics of the extravagant decorations– a topiary maze in the hallway, an oversized four-tier Cheshire cat cake and a bouncy house in the backyard. “Chi, come here, it’s your birthday party,” Kardashian West can be heard calling out in one video, as her daughter starts running off into the distance. The Keeping Up with the Kardashians star shared a clip of her the kids playing around on the floor. Auntie Khloe was the first on the scene to take in the festivities with her baby True. “We’re the first ones here on purpose,” Khloé Kardashian, 34, said on Snapchat. “Wow,” she added as looked at the over-the-top decorations. Kim shared a series of pictures including photos with daughter North. On Tuesday, Kardashian West shared a tribute to her baby on Instagram. A day before Chicago’s birthday, Kardashian West officially confirmed the surrogacy rumors and said she and her husband Kanye are indeed expecting their fourth child, People reports. During Watch What Happens Live with Andy Cohen on Monday, Kardashian West told the host they are “working on another child” with a surrogate. “We are,” Kardashian West responded when Cohen asked her if another baby was on the way. READ MORE: Women’s March 2019: Is there a place for Black Jewish feminists in this evolving national movement? “It’s a boy, I think it’s been out there,” Kardashian West told Cohen. “I got drunk at our Christmas Eve party and told some people. I can’t remember who I told because I never get drunk,” Kardashian West added.